Rain starved Chennai was hit with unprecedented record breaking rains, after a century, leaving in it’s wake a trail of destruction. 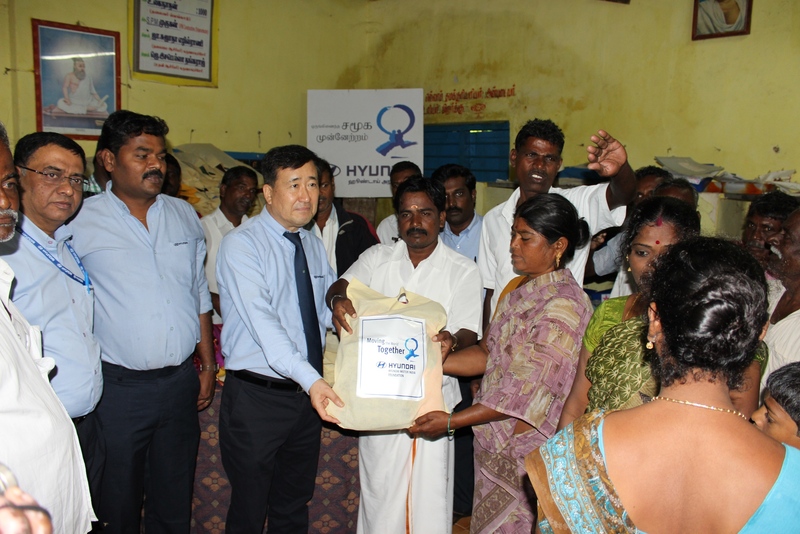 HMIF, the CSR arm of Hyundai motor India limited, swung into action immediately to help the flood affected. HMIF handed over 5,000 packets (4 chapathis and side dish, 1 packet milk biscuits, 2 bananas) on 4th December, 2015 and 6,000 food packets (2 Jam buns and 1 box of rice dish (puliyogare & chips) on 5th December, 2015 to the flood-relief teams set-up by the Tamil Nadu Government. These food packets have been airdropped to needy in the flooded areas in and around the Chennai city by Air Force Personnel operating from Tambaram Air Base. 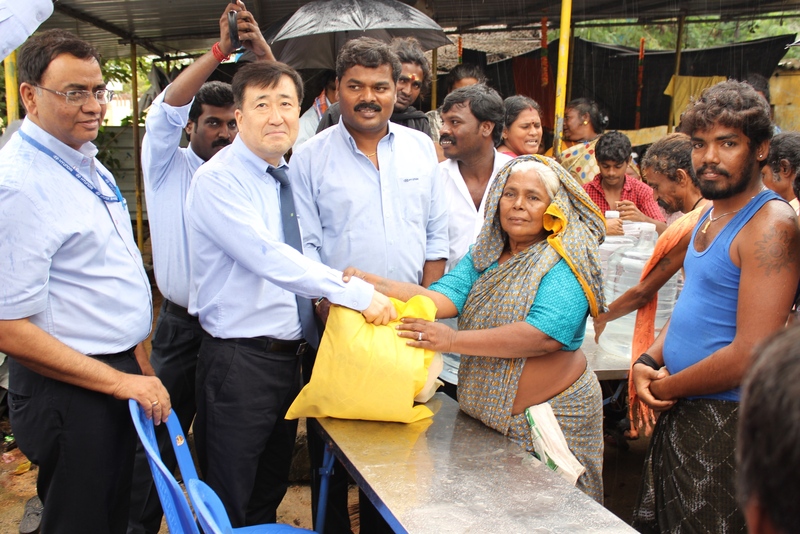 Today, Mr. Young Key Koo –Managing Director, HMIL and Mr. Vinayagam G, President, United Union of Hyundai Employees (UUHE) along with HMIF team members and HMIL volunteers visited Vengadu and Nemily villages in Sriperumbudur and distributed essential items like clothing for an entire family, blankets, towels and 20 litre water cans to 200 families. Similar items will be distributed in the villages of Perinjampakkam, Ottankaranai and Thathanur followed by distribution of utensils and provisions to sustain the families for 10 days. The relief measures will benefit 1000 families in these most affected villages and is expected to be completed by Dec 14th 2015. Paucity of essential materials is hampering relief work. Once the rains and the water recedes, HMIF will conduct a complete sanitization campaign for these same villages. Cleaning the entire village with tractors, mosquito fogging, spraying bleaching powder and cleaning water bodies are some of the activities on the anvil, to help the villages return to normalcy. In late November, HMIF distributed around 1000 Mats, 1,000 bed-sheets, 500 tarpaulins, 2,500 biscuit packets, 1,000 bread packets and 500 water tubs [20 litres] to 5 villages of Ettikuthimedu, Akkamapuram, Vellarai, KK Nagar, Kaduvancery of the Sriperumbudur block. These were among the worst affected areas in the region. HMIL volunteers with representatives from HMIF, UUHE (United Union of Hyundai Employees) handed over these items to 500 flood-affected families in the presence of the local government officials and respective panchayat presidents. These efforts cannot restore what is lost, but will definitely help the affected take the road to recovery and reconstruct their lives.